Very pale blush pink, anemone-form flowers, with yellow anthers and white filaments. Plant growth is dense and rapid, with dark, dull-green leaves.The flower resembles a daffodil as it opens, with a narrow trumpet of petals and stamens, topped by petaloids, surrounded by a corolla of wavy petals, that are recurved outwards. However, it doesn't bloom at Christmas - the flowering period is March/April! Very pale blush pink, anemone-form flowers, with yellow anthers and white filaments. Rapid, dense growth. Mid season flowering. Arrived within days of ordering, well packaged and ready for planting. Thank you. The plant arrived very quickly and proved to be a good size and healthy carefully and skilfully packed so that it arrived in excellent condition. The plants in the order are destined as a gift. The rapid response from the Nursery made this possible. Delighted with the camellia. Arrived promptly and in excellent condition. Many strong buds so looking forward to the flowers. 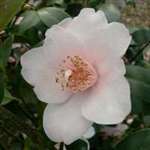 All the camellias delivered were a very good size and in tip top condition, having been excellently packed. As ever! Lovely plant, perfect condition. Well packed. Excellent, prompt service.